Sending a Smile Mini Rose Plant. The Sending a Smile Mini Rose Plant spreads sunshine and cheer with each brilliant bloom! 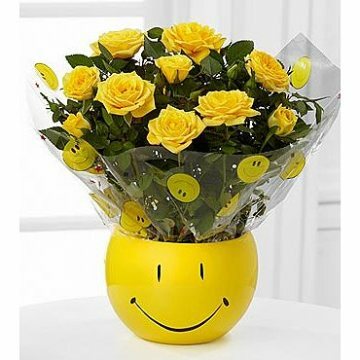 An incredible way to brighten their day, this yellow miniature rose plant is bright and beautiful seated in a yellow ceramic container with a simple smiley face accenting the front. Highlighted with a smiley face decorative wrap, this mini rose plant will keep them grinning day after day.